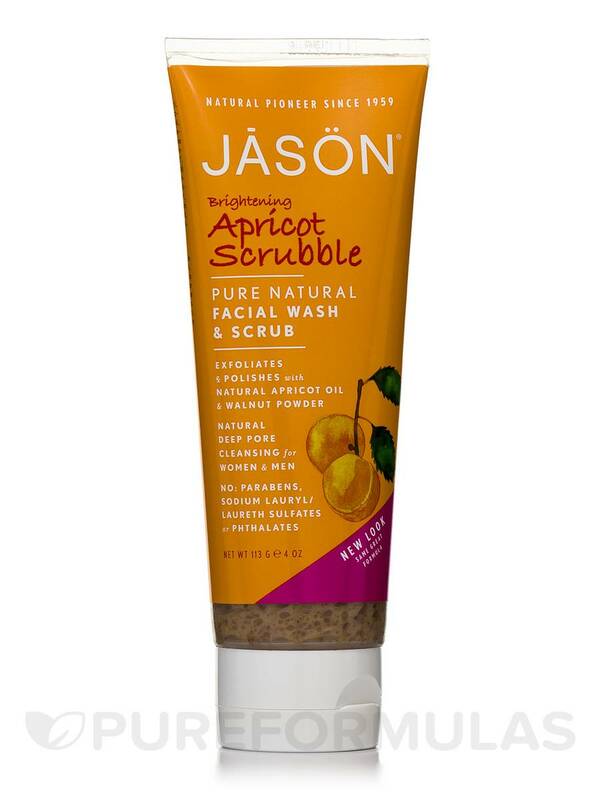 Brightening Apricot Scrubble by Jason Natural Products is a fantastic apricot scrub. It smells great, exfoliates well, and it's a gentle way to clean your skin without drying it. 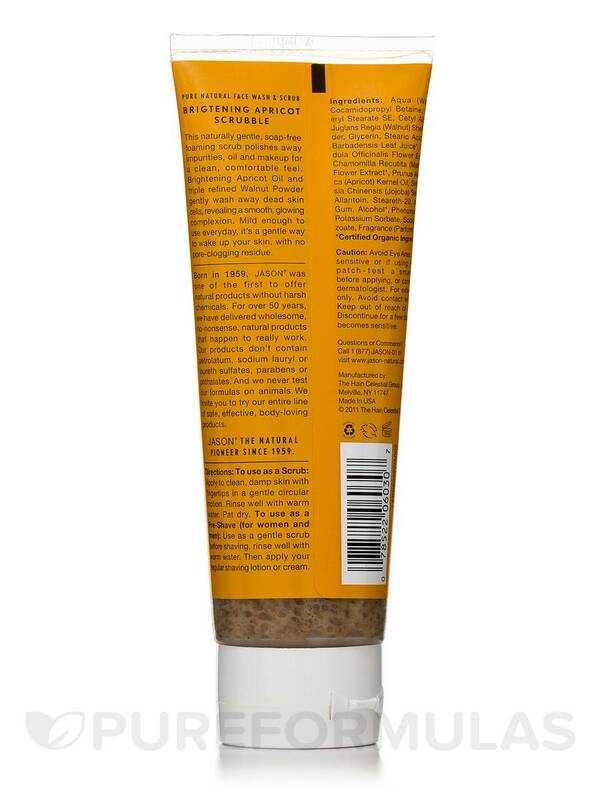 This naturally gentle‚ soap-free foaming scrub polishes away impurities‚ oil and makeup for a clean‚ comfortable feel. Brightening Apricot Oil and triple refined Walnut Powder gently wash away dead skin cells‚ revealing a smooth‚ glowing complexion. Mild enough to use everyday‚ it’s a gentle way to wake up your skin‚ with no pore-clogging residue. Aqua (Water)‚ Cocamidopropyl Betaine‚ Glyceryl Stearate SE‚ Cetyl Alcohol‚ Juglans Regia (Walnut) Shell Powder‚ Glycerin‚ Stearic Acid‚ Aloe Barbadensis Leaf Juice (1)‚ Calendula Officinalis Flower Extract (1)‚ Chamomilla Recutita (Matricaria) Flower Extract (1)‚ Prunus Armeniaca (Apricot) Kernel Oil‚ Simmondsia Chinensis (Jojoba) Seed Oil (1) ‚ Allantoin‚ Steareth-20‚ Xanthan Gum‚ Alcohol (1)‚ Phenoxyethanol‚ Potassium Sorbate‚ Sodium Benzoate‚ Fragrance (Parfum). To use as a Scrub: Apply to clean‚ damp skin with fingertips in a gentle circular motion. Rinse well with warm water. Pat dry. To use as a Pre-Shave (for women and men): Use as a gentle scrub before shaving‚ rinse well with warm water. Then apply your regular shaving lotion or cream. Product was a little gritty if you have sensitive skin this may not be for you.